Time to brag a little, I think. The two or three of you who read this blog regularly might recognize that photograph. Yes, it’s one of mine, and if you think back you might remember it from a post about an old film camera, from early this year. So what’s it doing on PopPhoto’s site? 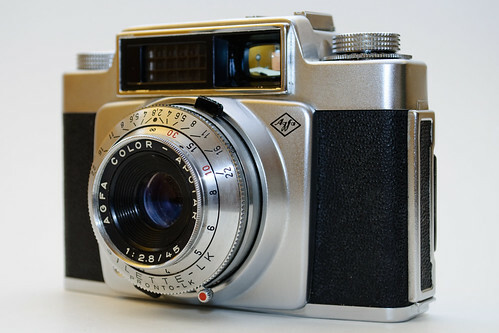 The camera again – an Afga Silette LK, a 1958 point-n-shoot. Most of us with school-age children, I imagine, have experienced the dreaded School Fundraising Scheme. It takes many forms, from bake sales and to book fairs, to barbeques and dance-a-thons. Things offered for sale range from T-shirts to badges and buttons, and occasionally, even magazine subscriptions. So, not too long ago, I was faced with a brochure including an absolutely enormous list of potential mags and rags. Happy to do my part, I settled on two: Inside Track Motorsport News, a magazine that I like to support since it sponsors events that I enjoy watching, and Popular Photography. PopPhoto hits a nice point for me – aimed at the serious enthusiast, it is distinctly lacking in the pretension of higher-end, glossy photography publications. One nice aspect of PopPhoto is that it runs monthly challenges, typically tying in with an article running in the current issue. 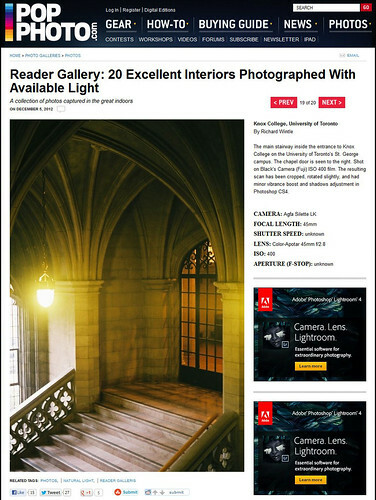 For November, the theme was “interior photographs with available light”, meaning without flash or other additional lighting. Game for anything, I submitted that photograph, it being a better example than anything I’ve taken on any of my digital cameras. Now, lest you think that my claim of “flipping through” the website sounds a bit disingenuous – well, it is. The fact is, I was looking to see if I’d made the list, since as far as I know, nobody is explicitly informed when they’ve been featured. What’s more fun is that this might mean I’m in the running for a prize, but we’ll see – that gallery has nineteen other photographs in it (although one of them looks to be an outdoor scene) and frankly, a lot of them look better to me than mine does. But we’ll see. 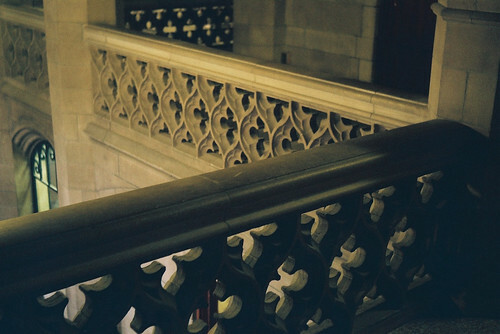 The photograph was taken in the lobby of Knox College, on the University of Toronto’s downtown St. George Campus. This handsome, Perpendicular Gothic stone pile was opened in 1915. Its lobby is filled with very pretty stonework, lovely fluted arches, and is lit with rich, warm lights. More of that gorgeous stonework – a bit underexposed, this time. Despite having had a relationship with the U of T campus since 1986, I don’t think I’d ever been through Knox College until a walk back across campus in late 2011, and I immediately knew I wanted to come back and shoot there. When January rolled around and I stuck the first roll of colour film in the then-new Silette, Knox was an immediate destination. Although I didn’t record all the details, I’m pretty sure I must have been holding my breath and shooting a very slow shutter speed to get enough light in, even with the lens wide open at f/2.8. But I’m glad I did, because the greeny-tan stone and the glorious gold of the lights married up nicely. The final result required very little post-processing – just a minor crop and straightening, a touch of lightening of the shadows, and a mild vibrance boost to make the golds pop a bit more. When it came time to dig through my back catalogue of photos for a few to enter, that one was an easy choice. 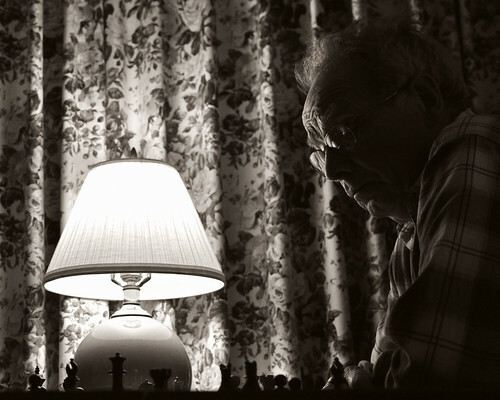 I also entered the one of the stone railings shown above, and one of my father-in-law engaged in a ferocious chess match with my son, this time taken with a modern DSLR. David. He’s played some chess in his time. So there you go. Three photographs submitted, and one in the running. I’m pleased as punch, and gratified that I made the first cut in the face of nearly 600 other entries. Now, we’ll just have to wait for a bit and see which photo wins overall – although I imagine a leading candidate would be the one used for the splash for the gallery on the PopPhoto homepage, a very fine photo of a stairwell at the Royal Ontario Museum – coincidentally located just a few minutes across campus from Knox. This entry was posted in Hobbies, Photography and tagged Agfa, film, hobbies, magazines, Photography, Popular Photography, Silette. Bookmark the permalink. Steve – there is a cash prize for the one that is selected as “best” (I imagine this selection has already been made). Plus publication in the print version of the magazine, which would be fun. But my vote would go to that one of the ROM staircase that I mentioned, not to my own. awesome. That first photo, and the second, do show imho what difference it makes with ‘real’ light (erh natural) and the camera only. Lots of congrats and good luck! That Knox College photo looks exactly like the view near the reference library in my old college, St. Xavier’s, in Bombay, India. Same architectural period, I guess. A quick Googling around reveals that Wikipedia (“who shall be believed some of the time”) claims “Indo-Gothic” as the architectural style. The photos I’ve seen of St Xavier’s certainly do look like a number of the U of T buildings, including Knox. Seems you were the recipient of a solid Jesuit education, Ken? Yes, the Jesuits got me both in grade school and college. Lots of good memories in college, though probably not from attending classes. Thanks for digging up that photo–especially timely since I’m working on a novel that has several scenes set in that location. Yeah, we used to call them “Elphys” 🙂 Xavier’s was definitely the place to be. Hi Richard.I pulled out my Brilliant (all metal) wonderful thing.The mirror is crusty and the lens is in need of a good clean.Can I just unscrew the front and have a go?Hate to see springs and things disappear into the carpet.I was thinking of perhaps introducing it to a 400 fast film,even though I’m tempted to try a grainy b&w,about a 100. This camera feels right and fairly intuitive too. I love the unique look these oldies give , and my favourite period is the 1930’s,so it’s a good thing.Cheers to you,steve. Hi Stephen, thanks for visiting. I’m not brave enough to take the shutter/lens assembly apart, but I do recall seeing tutorials on this somewhere. I suspect that all the Compur shutters work the same way, although cosmetically they differ from model to model, but I don’t know. I’d check out a few video tutorials and see what you can find out. I’ve read that replacing the mirror is dead simple and just requires dismantling the viewfinder assembly, pulling it out, and cut another piece from mirror glass from a craft store. I’ve taken the viewfinder apart on mine and cleaned everything, it’s easy. I’ve put various 400 and 100 films through mine and my favourite right now is Fuji Superia Reala (ISO 100) although I like Ektar as well. For faster colour film, Portra 400 might be a good choice. I don’t have a preference for B&W but I’ve used Kodak T-Max (100) and Tri-X (400). I have to say I much prefer the finer grain of the ISO 100 films. Thanks for that.I’ll look for the video tutorial.Mine is a “Brilliant”,so I’m guessing made for the English market. I fool around with a number of Box cameras,mostly Agfa’s and Brownies,really good on a sunny day.Lots of pixels! Steve.